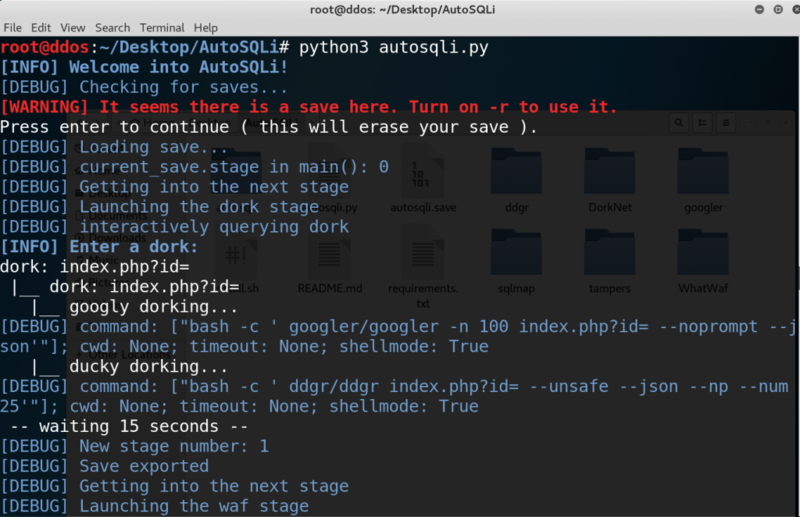 An automatic SQL Injection tool which takes advantage of ~DorkNet~ Googler, Ddgr, WhatWaf and sqlmap. AutoSQLi will be a python application which will, automatically, using a dork provided by the user, return a list of websites vulnerable to a SQL injection. To find vulnerable websites, the users firstly provide a dork Dorking, which is passed to findDorks.py, which returns a list of URLs corresponding to it. Then, AutoSQLi will do some very basic checks ( TODO: MAYBE USING SQLMAP AND IT’s –smart and –batch function ) to verify if the application is protected by a Waf, or if one of it’s parameters is vulnerable. Sometimes, websites are protected by a Web Application Firewall, or in short, a WAF. To identify and get around these WAFs, AutoSQLi will use WhatWaf. Finally, AutoSQLi will exploit the website using sqlmap, and give the choice to do whatever he wants! Also, AutoSQLi should work using Tor by default. So it should check for tor availability on startup.